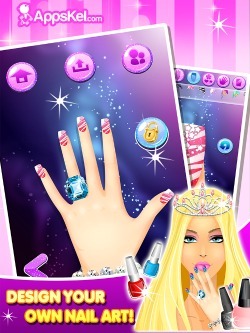 Click Here to Download Princess Nail Salon on iTunes Today! Give your nails a full makeover with Princess Nails Salon! Add some glitters and patterns only fit for a real Princess! Use colors and themes to show to everyone and impress! 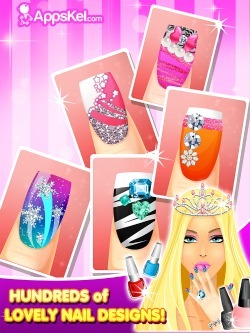 Download Princess Nails Salon and this will be the best app to let your fingers on! Preparing for a party? Need to style quickly? Princess Nails salon will give you great ideas in a jiffy! Impress everyone with great fashion and style! Show off your beautiful princess nails, and give them a perfect smile! Princess Nails Salon has lots of unique designs and things you can add to your fingernail. Adjust the gloss to your desired shine, and get the look that’s oh so fine! Always shiny and never dull, add some gloss and be more posh! Get the color that fits your mood, keep on changing them and this game will get you glued! Colors are always fun to add, it adds character to your desired style. Be bold and be fun, make the colors pop out, surely you’ll be the star of the show - no doubt! Use the pattern to show off your personality, take all the styles especially the ones that are free! Different patterns form different personality! From polka dots to zebra stripes, give your nails some cool vibes! French tips made easy. Get the funkiest and loveliest french tips in our gallery and apply them to your princess fingernail! From simple to extraordinary, we have them for you at the ready! Add some extra designs like a flower, a heart and even stars and diamonds! Add them wherever and whenever your nails need too! Explore the different background designs to complete the fanciest looking nail you can ever create! Glittery and glamorous and everything that’s famous! Save a design for each of your fingertips and go crazy! Or you can have it simple and have a set for all of them! Either ways, Princess Nail Salon will make sure to get you all the fun and have it done! 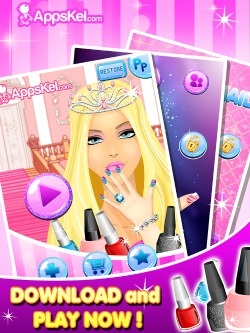 With a few scroll and taps, get your fantasy princess fingernail in a snap! Get the most glamorous fingernail, and get a rocking princess look! Combine different themes and unleash your glamorous creativity! More popping colors, sparkling gloss, lovable patterns, adorable nail tips, fun extras, and beautiful backgrounds can be unlocked through the in-game store! Make sure to unlock them all! Done with your fantasy Princess fingernail? Then show it off to your friends via Facebook or Email! Share it, show it, love it! Stay ahead of your glittery and glamorous style! Don’t get behind and get the most fashionable fingernail salon app! 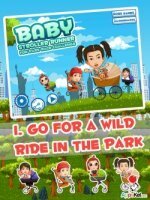 - This game is free to download and fun for all ages! - In-game purchases available to unlock more features. - Supports all versions of iPod, iPad and iPhone. 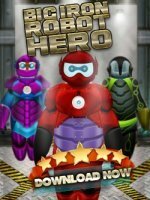 - Don’t forget to give us a good rating in the App Store!